On a trip to Tel Aviv, Jennifer Shanker stumbled upon the most exquisite jewelry she had ever seen. She quickly commissioned her wedding band from the talented designer. Losing no time in bringing his collection to New York, thus opening MUSE showroom, her career in this crazy industry began with her introduction of Yossi Harari to the US. We have much to thank Jennifer for (don't call her Jen, unless she loves you), but bringing Yossi mainstream takes the cake. Where would we be without gilver (if ya don't know, now ya know...gold and silver combined into ONE BRILLIANT METAL), y'all? Fifteen years and a thriving multi-designer showroom later, she is nominated (again!) for tonight's WJA's Award for Excellence in Sales. We're here to tell you, after having had the pleasure of hanging out alongside the hardest working #girlboss in the biz, we are psyched to get all gussied up and get TEAM SHANKER tonight. See everyone there! We'll be the ones inappropriately overdressed in sequins, lace and a ton of jewels. A cluster of MUSE designers, including the lust-worthy Yossi 'vinyl' ring on Jennifer's middle finger. 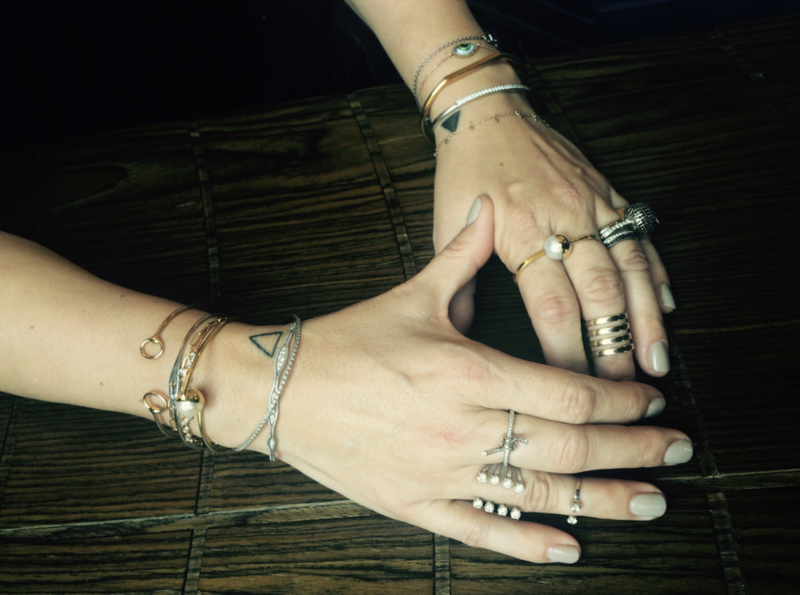 A glorious stack of MUSE designers, plus Jennifer's vintage Robert Lee Morris ring on her pointer finger. Jennifer's favorite stone, a rose cut diamond, can be found gracing her neck everyday in the form of a bezel set stone by Yossi Harari. A 14K gold daily reminder from Nora Kogan. 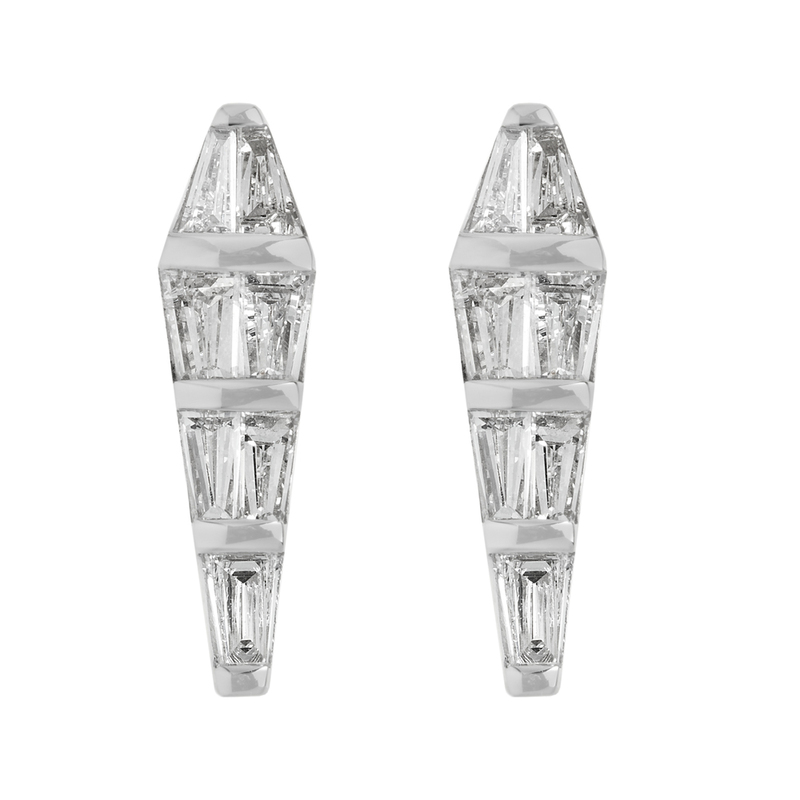 Nikos Koulis spectrum studs in baguette diamonds 18K white gold. Meredith Wing art, custom made drawings of MUSE designer's collections. Detail shot. Thus began our lifelong quest for Yossi Harari gold culottes. Bar Bolonat, a MUSE neighborhood fave. How long have you been in this crazy biz and what did you do prior? I have been in the jewelry business for 15 years. Prior to this I worked in non-profit and high-tech worlds. Congrats on COUTURE! Tell us about your inspiration for the booth. We launched a new marketing campaign at COUTURE with artist Meredith Wing. The ‘head to toe’ jewelry girls concept was a way for us to show how we see and style jewelry in a fresh and creative way. A non MUSE designer? Would have to be Mark Davis. Mark is a dear friend and a super talented designer. The one of a kind, super chic combinations of Bakelite and precious materials are right up my alley. Mark’s clean patterns, his balance of modern and vintage and his play with color are signature to his aesthetic – of which I am a huge fan. A brass knuckle ring by Robert Lee Morris that my father gave to me for my 18th birthday. It was the first piece of designer fine jewelry I received and surely affected my love for the alternative fine jewelry world. Now that the top online sites have raised the level of customer service to be equal to or greater than the service clients have come to expect, the end client is now shopping in a more familiar and comfortable, albeit online, environment. Barbuto will always be a neighborhood favorite and destination for visiting guests. The cuisine is consistently fresh and delicious and the cocktails are just as impressive. Bar Bolonat is a new neighborhood fave, and it doesn’t hurt that is in between my home and MUSE. The creative take on Israeli cuisine is an exotic, delicious addition to the West Village. Pub food and classic cocktails are best at The Spotted Pig. It is worth the wait. Either walking or riding the train, always. Flats or platforms – current faves for summer are Birkenstock flats and Jil Sander Navy platforms. You’re on a shopping mission in your hometown. Where is your go-to for the perfect party outfit? We recently caught up with the London based, French born, Director and creative mind behind her eponymous agency. Heading to Vegas next week with the likes of Noor Fares, Delfina Delletrez, and Lynn Ban in tow has us counting down the days before we meet again. Valery's hands on a typical day in London. The engagement ring presented to Valery on bended knee. Finger Between by Naomi Filmer – her first jewelry purchase. Why are we not surprised it's so non-traditional? 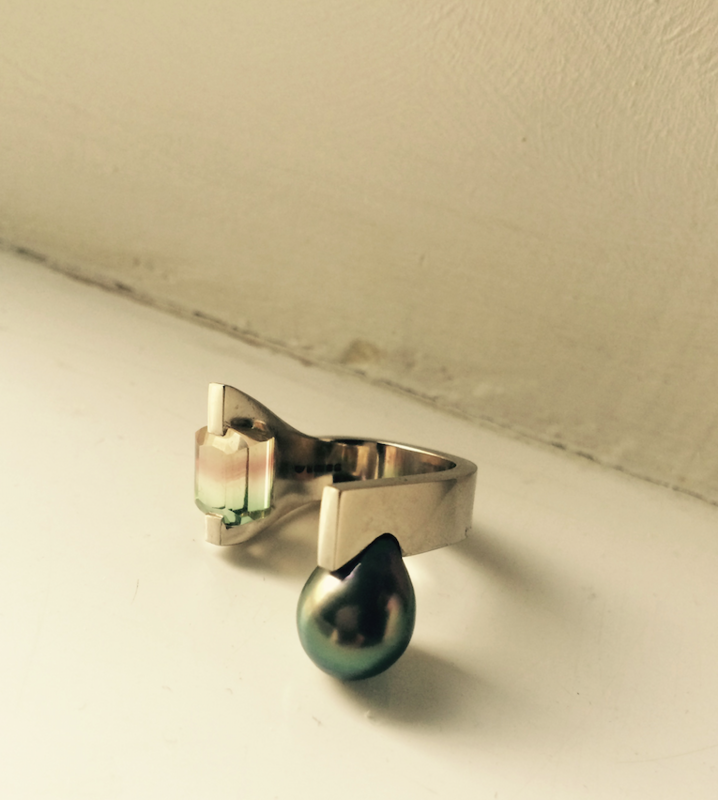 Her recently acquired custom-designed watermelon tourmaline and Tahitian pearl ring by Alexandra Jefford. We would go to Bread and Wine and we would eat modern Bristh cuisine. The restaurant itself is incredibly simple. Wooden tables, wooden chairs, simple glasses and dishware. The food speaks for itself. If you could own any piece of vintage jewelry, what would it be? A ring by Suzanne Belperron. Uruguay. It’s the most beautiful place I have traveled to and I have become obsessed with it. Life with Picasso by Francoise Gilot. Strangely, after a gemology course, I became obsessed with watermelon tourmaline. Since, I purchased one with a lovely Tahitian green pearl and commissioned a ring from my friend, jewelery designer Alexandra Jefford. I just collected the ring yesterday and I am besotted. A big bunch of freshly cut white peonies. I walk my dog in Victoria Park. A ring that fit in the empty space between my fingers, called Finger Bewteen, by Naomi Filmer. This was 15 years ago and the designer became my soulmate friend. David Altmejd – he is my close friend's brother. I love his work, it really speaks to me. Every time we meet, we start talking about his work and we get interrupted. My engagement ring. It was designed by a very dear friend, Vicki Beamon, and my boyfriend proposed on Valentine’s day on one knee with candles lit all around our apartment. He became my husband years later. We stayed engaged for 7 years – I wasn’t too sure about getting married! Our 1972 Ford Mustang with plum body paint and a cream roof. Angus and Julia Stone, Coco Rosie, The Growlers, Beach House, Empire of the Sun. I don’t cook, my husband does all the cooking! I would ask him to cook his seafood green Thai curry. Be honest – who’s your celebrity crush? Between Viggo Mortensen and Christopher Walken, both are so handsome and seem like interesting men. It would be a black soft calf leather Birkin bag by Hermes. I love Serge Lutens, Jeux de peau. It would have been Alexander McQueen’s Atlantis, I remember watching the show on a big screen and having goose bumps. Love Skin Ceuticals products. I have a manicure when I find the time, I have my haircut and colored every month, and a facial every two months; apart from that I’m low maintenance. My favorite thing to relax after a stressful week is a deep tissue massage. Signature nail polish for a night on the town?